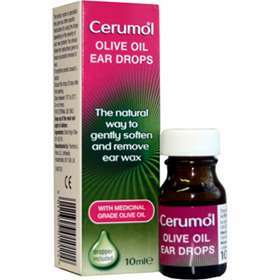 Cerumol Olive Oil Ear Drops is the natural way to gently soften and remove ear wax. Ear wax is an oily substance produced around the eardrum to protect it. From person to person the amount of produced wax varies but a build up of earwax can lead to partial hearing loss. Cermumol Ear Drops contain a medicinal grade of Extra Virgin Olive Oil which gently softens and helps remove earwax. For softening and removal of ear wax. Contains medicinal grade olive oil. Adults, the elderly and children over 1 year: Tilt head sideways with the affected ear facing upwards. Avoid touching the ear with the dropper. Using the dropper place 2-3 drops of Cerumol of the oil into the ear, then gently massage around the outside of the ear. Allow a few mintues for the drops to reach the eardrum by keeping the the head tilted and repeat in the other ear if required. Use the drops twice a day for up to seven days. Cerumol drops contain only Extra Virgin Olive Oil of medicinal grade. There are no other ingredients added. Once opened, store the dropper in the bottle. Store between 10'C to 25'C (Do not freeze). Do not use if you are sensitive to Olive Oil. Do not use on an infected ear or if the ear is bleeding, ruptured or inflamed. Do not use on children under the age of 5 without the supervision of a nurse or doctor. Do not use if the dropper is broken or damaged. Consult your Doctor if you are using any other medication in your ear before using Cerumol. There are no known side effects when using Cerumol Olive Oil Ear Drops. If drops cause irritation in the ear or you notice any side effects, stop using them and inform your doctor. Depending on the severity of your ear wax problem, a doctor, nurse or specialist may give you other specific instructions for using Cerumol.